Hello you may have hopped over to me from the lovely Mo and seen the lovely project she has done or you have just joined the Blog Hop with me. This month’s theme is Caseing the Annual Catalogue. Caseing is an acronym for “Copy and Share Everything”. 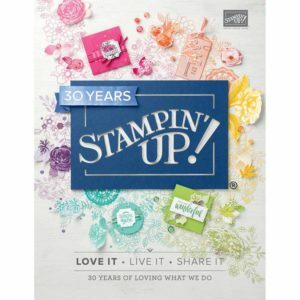 When it comes to CASEing stamping – it can mean creating an exact copy of a card or project that you saw or received or it can mean using a card or project as an inspiration. What ever it means to you, CASEing is a great tool to have in your craft kit! I did find this challenging as I could not make up my mind which card/item I would CASE. In the end I chose the card on page 60 using the Coffee Cafe stamp set as I have not used this stamp set before. The ink colours I used are Soft Suede, Grapefruit Grove, Daffodil Delight (ribbon), Pineapple Punch, Petal Pink and of course Whisper White. For the card base I used Petal Pink card stock. The mat layer is a piece of the 2018-2020 In Color Designer Series Paper. This was stuck to the card base. Then the strips of paper were stuck at angles to form a back ground. For this I used Petal Pink and Grapefruit Grove card stock and a strip of the Pineapple Punch DSP. Then I stamped the hearts and coffee beans from the stamp set in Soft Suede. Next I stamped the coffee cups using Grapefruit Grove and Soft Suede ink and die cut before putting them together. I die cut a piece of Grapefruit Grove card stock to go on the middle of one of the cups. To this I fixed some Daffodil Delight Double Stitched ribbon across the cup and stuck a bow on top. 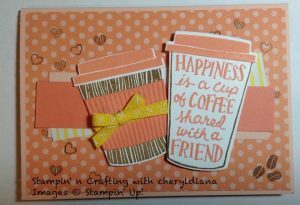 Finally I fixed the cups onto the card using Stampin’ dimensionals. I hope you have enjoyed my projects today. Please do leave comments as you go through the blop hop. Please click on the next button to visit Jenna and see her lovely projects. Lovely card, Cheryl. I like you’ve chosen the grapefruit grove as the main colour and it goes so well with soft suede. The more I use that colour the more I like and I wasn’t a fan much a few months ago.